Internet advertising revenue continues to grow, thanks to mobile, but the Silicon Valley duopoly of Facebook and Google swallowed up almost the new money. 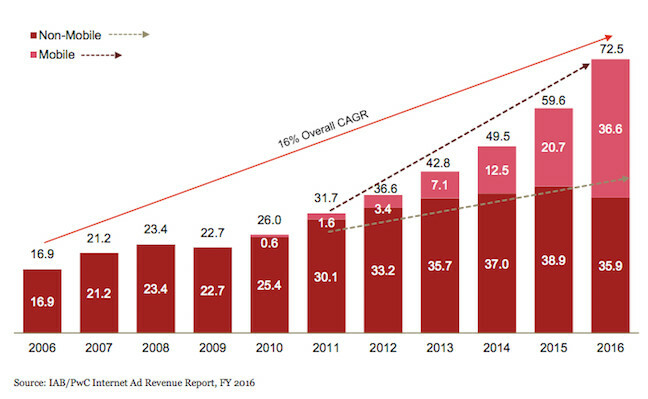 The internet ad industry's annual report this week shows that desktop ad revenue fell for the first time since the financial crash of 2008/2009 and mobile spending raced past it. Mobile advertising now makes up more than 50 per cent of internet advertising revenue, passing the landmark for the first time. But alarming for the digital ad business, which seeks to act as an alternative for brands and publishers to the duopoly of Google and Facebook, the Silicon Valley giants are swallowing most of the growth. Two analysts have read the runes and came up with different calculations, but they don't differ by much. Pivotal Research Group's Brian Wieser – who you may remember commenting on the recent YouTube ad boycott – reckons the duopoly handles 77 per cent of gross digital ad spending, up from 72 per cent in a year. However, "99 per cent" of industry growth is attributable to the two giants, he believes. Analyst Jason Kint calculates that Facebook and Google take 89 per cent of new growth. Wieser's figure is disputed by the IAB, which is however reluctant to come up with an alternative number. IAB executive David Doty, who has an interest in talking up the health of the open market – AKA everyone except the duopoly – said that the top 10 digital companies contributed "only 69 per cent of the growth" so both Kint and Wieser's estimates are wrong.